Roller Blinds have been around for centuries. However, they are becoming more popular with the help of modern technologies. Roller blinds have the added benefit of being easy to automate. Believe it or not, modern roller blinds can be remote controlled. 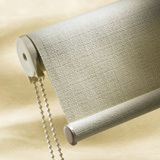 In the beginning roller blinds were as simple as a rolling up a shade and tying it in place. Even today people will seek the casual simplicity of a blind that rolls up and ties off. Picture a simple fabric like canvas rolled to the top or side and tied off by a canvas ribbon or large nylon chord. Then, we have the spring assisted and chain drive systems. These systems are mechanical. They allow you to roll the blind up without the physical effort of classical roller blinds. They still take some hands-on effort. However, because of the mechanical assist they are meant to be easier. Of course the industrial revolution is made great by the advent of electricity. This too applies to roller blinds. Add in a battery and remote control and the roller blind becomes fully automated. Automatic blinds are part of the new rage in energy efficient blinds. Automatic blinds can be set to roll up and down on a time schedule. Others are based on light sensitivity. This allows the blinds to adjust to sunlight and help to regulate home temperature without draining the AC. The remote control allows you to have external blinds that can be controlled without stepping outside. For those of us in Arizona, that is a huge relief. When it gets to 128 degrees F you don’t want to step outside to adjust the blinds. So whether you’re looking for that outside resort feel of a canvas roller blind or looking to update your house to the new millennium, roller blinds may be your next design detail.